To me, the Insidious movies are what they are; effective but ultimately standard horror films, ones that have a few decent ideas but not much else to separate them from many of the other movies like them. The first one, directed by James Wan and written by Leigh Whannell – who also co-stars in the series as a supporting character – I remember being fairly okay, a couple of inspired scares and images, but honestly not much else for me to latch onto; the second, also directed by Wan, felt like an unnecessary epilogue to the first one that straight up turns into The Shining in the second half; and the third, which Whannell directed as well as wrote, had some likeable qualities to it but, just like the first movie, nothing about it really stood out from any other horror movie I had even seen that year. The pattern with this series seems to be something like this: the odd-numbered ones are okay, the even-numbered ones are whatever, and for the fourth and presumably final entry, this series is more whatever than ever before. 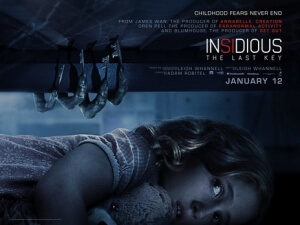 Insidious: The Last Key, which is this time directed by Adam Robitel whose previous credit was for the final Paranormal Activity movie, is set just after the third movie, but right before the first one (seriously, the timeline of these movies can get so confusing). We learn that supernatural medium and franchise figurehead Elise (Lin Shaye) grew up in a rough household on a penitentiary site in New Mexico, where she was treated horrifically by her father for her continued insistence that she can communicate with ghosts. One thing leads to another, and young Elise becomes responsible for unleashing a powerful demon that quickly takes her already troubled family life to much deeper depths. In the present, Elise and her assistants Specs (Whannell) and Tucker (Angus Sampson) receive a call from a man who’s experiencing supernatural occurrences in the very house that she grew up in, and she resolves to go and help to try and quite literally confront her personal demons once and for all. Whatever you may end up thinking of this film, let’s take a moment to reflect on how awesome it is that in this day and age, a 74-year-old woman is headlining a major theatrical horror franchise, and always seems to give it her all in each of these films. Lin Shaye, who is once again the best part of an Insidious film, is an actress who is always fun to watch on-screen, especially in a throwaway horror movie like this, as she will just take whatever she is given even if it’s the sloppiest piece of writing, and really moulds something out of it that really works for her as well as the audience. She alone makes this character who, in the wrong hands, could so easily have been portrayed as a one-dimensional stiff or flawless hero that can do no wrong, into someone who you’re more than happy following for an entire film, or at the very least all the scenes she appears in during the first two of these movies. Once again, Shaye does just that for her fourth go as this character, and while the material she’s given isn’t necessarily the strongest, by God does she make the most of it. That, however, is more than I can say about the rest of the film, which by January horror movie standards is not even close to being the worst of its kind, but still isn’t a particularly strong horror movie in its own right. It’s missing the same kind of passionate touch that Wan or even Whannell brought to their entries, because regardless on your overall thoughts on these movies you can tell that they were made by people who really seem to love this set-up and, if they wanted to, could have this movie go in any direction they so well please. Robitel, however, isn’t quite up to the same level as either Wan or Whannell, and instead gives us a vision that feels uninspired and, at several points, rather dull. It’s not really that scary, as it relies too frequently on standard jump-scares and the loud musical sting that accompanies them, which aren’t effective here because with each one of them you can tell when something scary is about to happen, without any kind of build-up or chilling atmosphere to go along with it. Even Whannell’s script for this one isn’t up to the usual standards we’ve come to expect from this series – there aren’t that many interesting new character developments, the moments of light comedy don’t work as well because they’re more cringeworthy than humorous (a mini sub-plot that sees Specs and Tucker trying to hit on a pair of much younger characters that factor into the plot later is like watching your creepy uncle hit on your hot friends after a few drinks), and there are parts to this contained plot and ghoul-friendly environment that are pretty corny or don’t even make that much sense. With this one, they’re also treating it as the last one since the ending ties directly into the events of the first one which, as those who have seen it will know, is where Whannell seriously wrote himself into a corner by effectively denying this series and this character any longevity outside of that main storyline. That means that, unless they go further back in time for a fifth movie that takes place before the third film which is currently first in this timeline (seriously, the chronology of these movies is so complicated), which doesn’t seem all that likely given Shaye’s age, this is pretty much where the Insidious movies come full circle, and that also means this series ends on a note that isn’t necessarily awful, but given everything that came before it could have been far more impactful than it ended up being. Instead, like most of the rest of this series in my opinion, it lands with an unimpressive but above average thud. Insidious: The Last Key doesn’t offer anything of interest for the fourth and presumably final film in the series, outside of Lin Shaye who once again rules an Insidious movie, and concludes the series on a dull and unimpressive note.